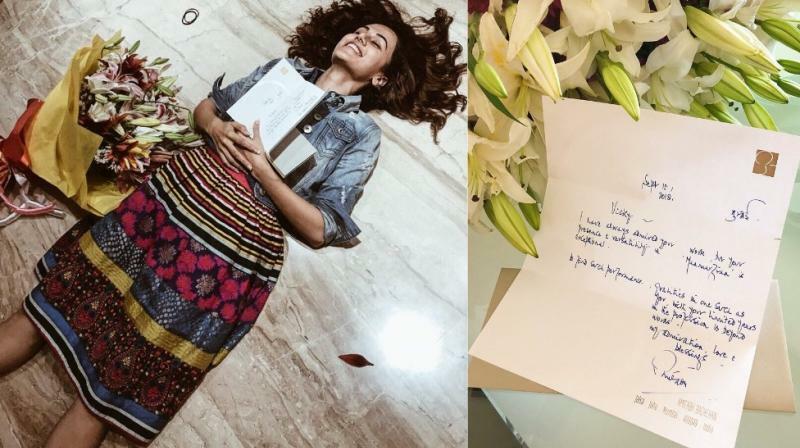 The actors shared a picture of a note and a bouquet Amitabh Bachchan sent them after watching their film. Pictures Taapsee Pannu and Vicky Kaushal shared on Twitter. Kaushal tweeted, "This means the world to me! Thank You @SrBachchan Sir for this hand written letter of appreciation and bouquet #Manmarziyaan." The letter read how Bachchan has always admired his work for his "presence and versatility" and his performance has been "exceptional". Pannu, who has previously shared screen space with Bachchan in ‘Pink’, shared her photo - sprawled on the floor with the letter in her arms and the flowers by her side. "Finally! THIS LETTER! A milestone achieved!" the actor, who is set to reunite with Bachchan in ‘Badla’, tweeted. Also read: When Abhishek Bachchan turned AD on the sets of Manmarziyaan! ■When Abhishek Bachchan turned AD on the sets of Manmarziyaan!